If you are writing your own letter make sure you include the application number and your address. Everyone 18 and over in your household can have his/her own say. You can use the same envelope or email address. Save a copy of what you write and use it to contact your local councillors and your MP. Check out the documents online or view at the Council offices on request. It is an election year. With UKIP and others, there is a new level of climate change denial, a threat to cancel all targets on greenhouse gas emissions and plans to stop the development of renewables both wind and solar in its tracks. Frack Free Solent are helping organise an information meeting about fracking, Friday 24 October at 7.30pm in Funtington Community Village Hall, Southbrook Rd, West Ashling, PO18 8DR. Map More details to follow. Here’s a roundup of what’s been happening locally, plus upcoming Frack Free Solent events for March. Don’t forget to check our website for up to date info, news & more. We are regularly monitoring the site at Markwells Wood, Forestside – a few hundred yards north of the T-junction here – https://goo.gl/maps/qJSPq . The oil & gas exploration site is owned by Northern Petroleum (50%), Magellan Petroleum (40%) and Egdon Resources (10%) with NP holding operator status on the site. With their planning permission for further exploration renewed until March 2015, we believe Northern Petroleum will be investigating the possibility of hydrocarbon extraction using fracking. We have spoken to many local residents, who are very concerned at the prospect of having an industrial fracking site on their doorstep – despite the best attentions of Northern’s PR firm taking many of them out to lunch, sending presents etc. Frack Free Solent is organising a public meeting for local residents on Saturday 15 March from 10am – 12pm at Forestside & Stansted Village Hall (just opposite Christ Church, on the road to Stansted Park – http://goo.gl/maps/oD3QG Please pass this information onto anyone living locally who would be interested in finding out more about what fracking could mean for the area. We have two benefit music nights coming up soon, put on to raise funds for the costs of campaigning against fracking – printing leaflets, hiring halls. SEIZE THE DAY Internationally known radical English acoustic band with global roots – don’t miss them! Plus support band Wheels of the World & guest appearance by Vanessa Vine, Balcombe campaigner. Ticket price includes a light supper (veggie). Soft drinks and licensed bar available. All proceeds go to Frack Free Solent. Tickets in advance from Jenny Flintoft email or 023 9241 358 – £8/£6 concessions. 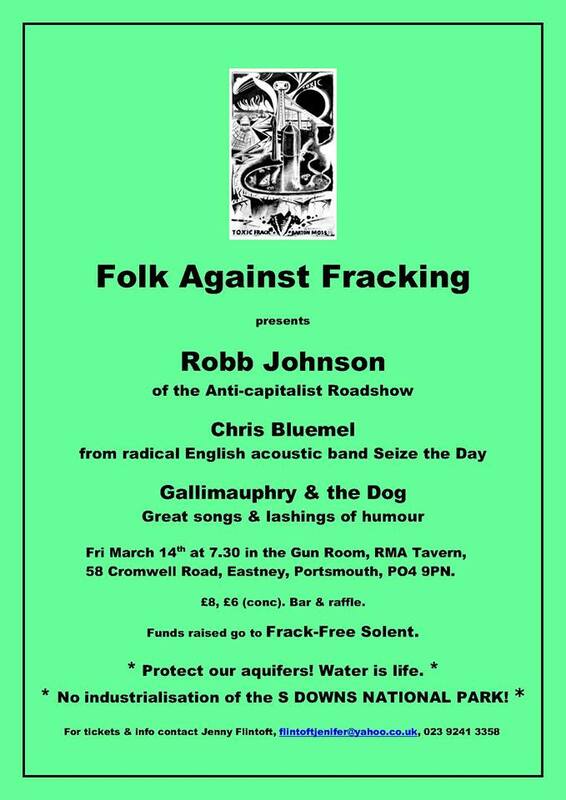 All proceeds go to Frack Free Solent. The inspiring battle against fracking currently taking place in Balcombe is rapidly unravelling some of the illusions people have about the society they live in. It is clear for all to see how big business dictates government policy and uses the police as publicly-funded private security to protect its own anti-social activities. As opposition to fracking grows, and actions against it force the issue on to the public agenda, there has also been an increasingly hysterical tone to the reporting and commenting in much of the media, which has blown apart any pretence of neutrality and exposed to many the existence of corporate interests lurking behind the scenes. Desperately trying to regain control of their readers’ opinions, the shrill cheer-leaders for the industry have been wheeling out everything from phoney stories about the harmlessness of fracking to endless attempts to denigrate the protesters, though they never seem sure from one day to the next whether to be dismissive, sneering or alarmist. The scale and effectiveness of the protests are pushing this media propaganda machine over the cliff edge of invective. A marvellous example of this can be seen in today’s DailyTelegraph. You can almost see the froth from the leader writer’s pursed purple lips flying out at you from the text as he (and it probably is a male) condemns all of us who have protested at Balcombe as a “shrieking chorus of environmental zealots”, a “travelling circus of protest”, “new Luddites”, “eco-loonies” and, in crowning red-faced triumph, “enemies of progress”! Progress, eh? Now what do they mean by that? Obviously, by the Telegraph’s definition, it includes fracking. It will also include any other form of mineral extraction, whether in the south of England, the Niger delta or the Arctic. It includes road-building, of course. And airport expansion. And massive new housing estates all over the countryside. And high-speed rail lines. And nuclear power stations. Anything where there’s money to be made. Historically, “progress” has included the genocide and environmental disaster inflicted on North America by the invasion of European settlers. It has included the loss of the rainforests, the pollution of the oceans, the extinction of species after species. In the future, “progress” will inevitably take us into a world barely imaginable, where there is hardly a drop of fresh water to drink or a gulp of uncontaminated air to gulp in. The idea of “progress” extending infinitely into the future is insane on a finite planet, as has been so often, said, but still its adherents cling to it. “Progress” is the attitude that places financial profit at the top of the list of priorities for the human race, that sets it up as the pinnacle of all that we can aspire to. Money does not even exist, it’s all just tokens, but for the “progress” death cult, it is all that matters. The “economy” always trumps the Earth. This is a complete inversion of the morality that has always been cherished by humankind. We care about nature, we care about animals and we care about the future we will leave behind for our children and grandchildren. Not so for the hard-nosed peddlers of “progress”. It’s all about short-term gain, quantity rather than quality, endless machineries destroying the living flesh of our planet and converting it into massive piles of toxic rubbish, just to generate a bit more temporary wealth and privilege for a tiny elite. Alongside all this is the mindset of “progress”, or what I’d be tempted to call the “mindtrap” if such a word existed. The advocates of “progress” demand that we share their assumption that society’s movement towards greater and greater industrialisation and destruction is not only desirable but inevitable. With the arrogance of unchallenged power, they assume that there is only one future for the human race, namely the one they have laid out for it. Anyone who dares to dissent from their master plan does not even merit the courtesy of a reasoned discussion – just abuse, derision and baying bloodthirsty calls for violent state repression of their unauthorised opinions. As I’ve said before, the advocates of “progress” attempt to tie their own interests into the very notion of time itself, implying that movement in this particular linear direction is as inevitable as the passing of the seasons, or centuries, or millennia. Critics are dismissed out of hand with the claim that “you can’t turn the clock back” – and yet you obviously can, for a clock, though designed to measure the passage of time, is not time itself and, as an artificial creation of humanity, can be artificially manipulated to record whatever time we want it to. Likewise we can step back from the false connection made between the thing they call “progress” to the actual progression of time, the dawning of new days. The future is not yet written and we do not need to – indeed should never allow ourselves to – accept any particular vision of what it should be. I, for one, cannot accept that we are condemned to sit by and watch our planetary life-support system torn apart, poisoned and irreversibly damaged – and certainly not on the say-so of the professional liars and placemen who pass themselves off as journalists and politicians in our debased and entirely undemocratic society. I, for one, am proud to be a twenty-first century Luddite, proud to be a zealot for the protection of the planet, proud to be an enemy of their “progress”. In fact, I would say that if you’re not an enemy of “progress” then you’re an enemy of life itself. Right – no time to waste. I’m off to catch the train back to Balcombe.